WIN A 3 DAY PAY-PER-VIEW PASS TO WATCH THE MOST EXCITING STREAM IN 2014! Steinway Cafe and Billiards and Inside POOL TV are pleased to announce a legendary challenge match series between Efren Reyes and Earl Strickland will take place January 14-16, 2014 and is being hosted by Steinway Billiards in Astoria, NY. Specially priced tickets for the Pay-Per-View event are now on sale at InsidePOOL.TV. The match series will feature three disciplines of pool; 8-ball, 9-ball and 10-ball with each day showcasing one style. The matches will all be races to 17 on a 10-foot table. The series will be live streamed at InsidePOOL.TV. To watch online via PPV, passes can be purchased at InsidePOOL.TV and are available for purchase. Pricing for the online PPV will be $10 per day and $25 for the three-day pass, for a limited time. 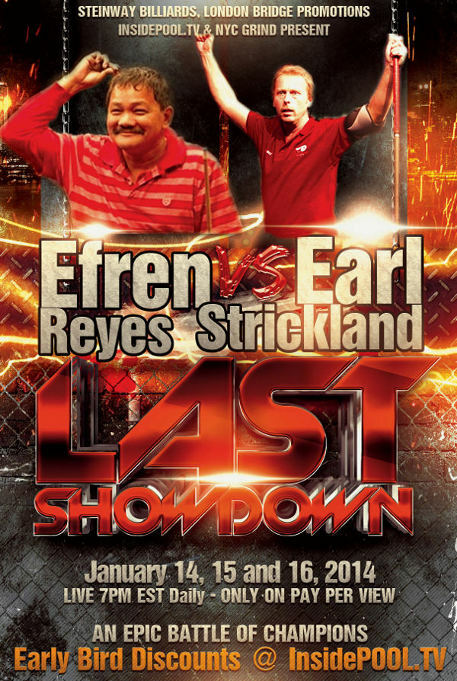 Who do you think will win... Efren Reyes or Earl Strickland? ...You can enter here in the PoolPT forums and check the full list of entries on the Pro9 forums. Come on my friends - this is slated as THE LAST SHOWDOWN - don't miss it!!! 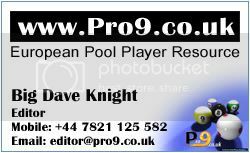 80+ entries from all over Europe - check the list on the Pro9 forums. I still need more entries from PORTUGAL please? Still accepting more entries please all this week! ...Sorry, the original link didn't work! Ponho 20paus no Earl, como ganha a melhor de 3, aceitas? There's still 24 hours to enter this competition! Dave, can I ask you a favor bro??? ?